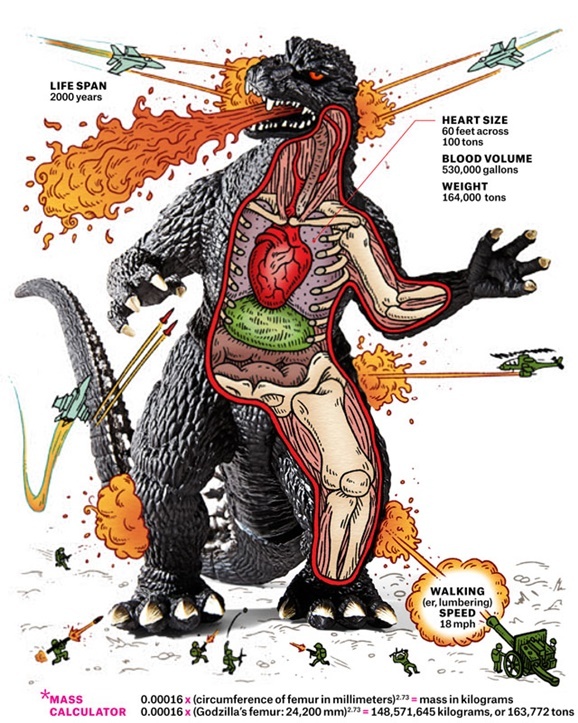 The anatomy lesson comes courtesy of Popular Mechanics (and illustrator Andrew Rae), who picked the brains of scientists to determine just what would have to be going on inside Godzilla to keep the big guy going. They even take into account that he’s grown over the years, now standing 30 stories tall and weighing “as much as a cruise ship.” Of course, it’s somewhat moot since a creature the size of Godzilla is impossible: “It would overheat, its organs would implode, and it would need to mainline butter to get enough calories.” Leave it to the scientists to ruin everybody’s fun, the party poopers. Popular Mechanics speculates that Godzilla would weigh in at around 164,000 tons, which is quite a bit above the theoretical weight limit for land animals, which tops out between 110 – 1100 tons. His bones would also need to be ridiculously strong to support his weight — they’d be bearing 20 times the force of the bones of a T. rex. His cartilage would also need to be 12 times stronger than a human’s. My only complaint is that they don’t address his atomic breath. What sort of half-assed Godzilla anatomy lesson overlooks the atomic breath? 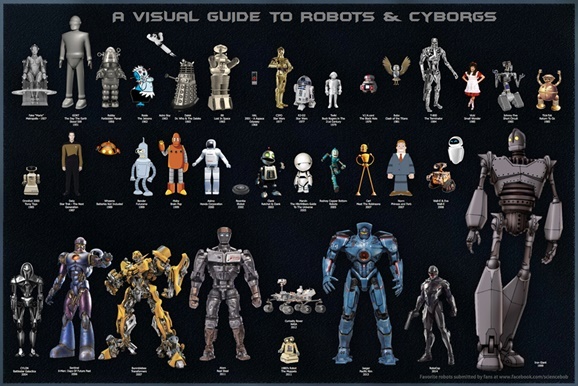 They aren’t to scale, as you probably noticed from the fact that 2014 RoboCop is shown two-thirds the height of Pacific Rim’s Gipsy Danger. You can see an even more ginormous version of the poster on Bob’s site.